Luke records, in the book of Acts, an important historical event involving Paul during the 18 months he worked at Corinth (Acts 18:12-17). The photo below, made in May 2012, shows the actual platform or bema mentioned in Acts 18. Popular English versions use the terms tribunal, judgment seat, place of judgment, or judge’s bench. 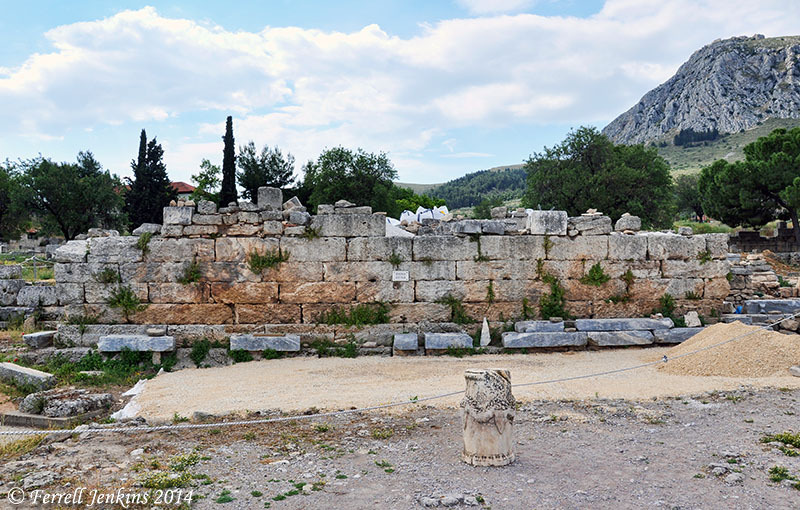 The Bema at Corinth where Paul stood before Gallio. Photo by Ferrell Jenkins. You see that some sort of work was going on around the bema. Notice the rope, the pile of sand, and the bags on the top. I remarked to some of our tour members that we formerly were able to stand on the bema. I feared this might be an end to that practice. Recently the Bema was repaired and reopened so tourists can walk up and stand where Gallio passed judgment on the Apostle Paul (Acts 18:12-17). Anyone have a nice photo to share of the bema since the restoration? This entry was posted in Archaeology, Bible Places, Bible Study, Book of Acts, Greece, New Testament, Photography, Travel and tagged Apostle Paul. Bookmark the permalink.